Scarce map illustrating early fur trading outposts. A New Map of the Great West. An uncommon and fascinating map of the American Midwest drawn by Erastus Flavel Beadle in 1856. The map extends from Ohio to the Rocky Mountains and from Canada to Texas' northernmost border, including all of the Great Lakes, and early configurations of Nebraska, Kansas, and Minnesota Territories. East of the Mississippi, the map offers a detailed accounting of the railroad system, with individual lines named. West of the Mississippi, the map focuses on American Indian groups, topography, river systems, and trading posts. The routes taken by John Fremont and Stephen W. Kearny are noted. The map also illustrates 'Manuel's Ft.' in the Black Feet region north of the Yellowstone River – one of the earliest known constructions on the Upper Missouri. Lisa was a Spanish and later U.S. citizen born in New Orleans, Louisiana. Sometime between 1806 and 1807, he established Fort Raymond at the conjunction of the Yellowstone and Big Horn Rivers. That fort is shown here, but not specifically named. Apparently, it was at the time just a shack with two rooms and a loft. Later it was expanded and became a destination for fur traders, who ignoring the established name referred to it as Fort Manuel. In 1809 Lisa, along with William Clark, founded the St. Louis Missouri Fur Company. Shortly thereafter Lisa abandoned Fort Raymond, gathered a group of 300 tappers, and expanded operations further westward. He established a new fort, Fort Lisa, at the mouth of the Little Missouri and Big Knife Rivers in what is today North Dakota. Fort Lisa is identified here as 'Manuel's Ft.' Fort Raymond was subsequently abandoned. The 1811 overland expedition to found Astoria at the mouth of the Columbia River famously visited the Fort Lisa on their tragic voyage. A year later, John Luttig, a clerk at Fort Lisa, recorded that on December 20, 1812, Sacagawea, Louis and Clark's Snake squaw Guide, died there of 'Putrid Fever.' She was on her way home. In what is today Colorado, here illustrated just prior to the 1859 Colorado Gold Rush, Denver does not yet appear, but Canon, Fort St. Vrain, Pueblo and Fort Lancaster are named. The map also illustrates the huge, nebulous Nebraska Territory created in 1854, extending west of Minnesota and north of Kansas to the modern-day Canada border. Kansas extends to the Rocky Mountains and includes the regions allocated to the Arapahos and Cheyennes. The Indian Territory is identified here as Cherokee territory. The map was prepared by Erastus Flavel Beadle for publication in Jacob Ferris' historic work, The States and Territories of The Great West (Miller, Orton, and Mulligan). It was engraved and printed by Warren and Buell of Buffalo. Erastus Flavel Beadle (September 9, 1821 - December 18, 1894) was an American printer, land speculator, and publisher active in the middle part of the 19th century. Beadle was bornin Saratoga Springs, New York. Beadles family settled in Chautauqua County, New York, where he worked for a miller name Hayes. There he began to learn rudimentary type making and printing by cutting wooden letter to print labels on bags of grain. In 1838 he apprenticed himself to H. and E. Phinney, publishers based in Cooperstown, New York. Under Phinney, he mastered typesetting, stereotyping, Binding, and engraving. He moved to Buffalo, New York in 1847, taking work as a stereotyper. His brother Irwin Pedro Beadle (1826-1882) also moved to Buffalo two years later where the two founded a stereotype foundry. In the mid-1850s both brothers became involved in land speculation schemes in Nebraska Territory, with Erastus acting as an agent and Irwin, a settler. Irwin moved to Nebraska in 1856, founding the boomtown of Saratoga, now part of Omaha. Erastus retired to Cooperstown, New York, in 1889, where he died on December 18, 1894. 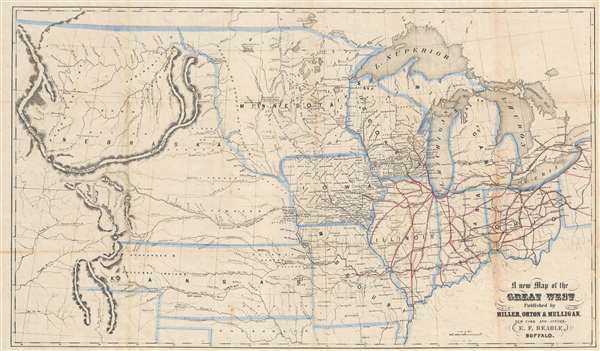 Ferris, Jacob, The States and Territories of The Great West; including Ohio, Indiana, Illinois, Missouri, Michigan, Wisconsin, Iowa, Minesota (sic), Kansas, and Nebraska (Buffalo: Beadle, New York and Auburn: Miller, Orton, and Mulligan) 1856. Good. Backed on archival tissue. Wheat, C. I., Mapping of the Transmississippi West, 1540 – 1861, #885. Rumsey 3219.002. Wagner, H., and Camp, C. L., The Plains and the Rockies: A Critical Bibliography of Exploration, Adventure, and Travel in the American West, 1800-1865, #274a.